In 1934, it was one woman who improved the welfare of working equines for decades to come - Dorothy Brooke - the founder of Brooke, the world’s largest international animal welfare charity. In her memory, Brooke USA is proud to announce the creation of The Dots, a national women’s initiative to support Brooke USA that carries on the legacy of our namesake. 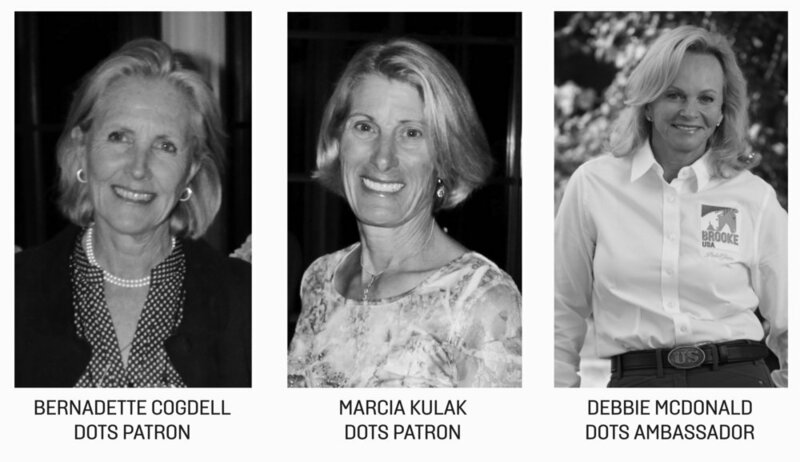 The Dots are a network of dedicated women continuing the legacy of Dorothy Brooke’s compassion for working equines. The group is a natural fit for Brooke USA, as many of the people who benefit in communities around the world are women who rely on their working equines to help provide for their families. The Dots members each pledge $1,000 annually to Brooke USA, to fund equine welfare programs across Asia, the Middle East, Africa, and Central America. Yearly membership in The Dots includes: an annual silver charm to commemorate membership, an invitation to an annual garden party with a guest speaker from Brooke USA, a copy of Dorothy Brooke’s inspiring biography and a listing with your photo on our Brooke USA website. Join The Women Whose Compassion Is Changing The World For Working Equines! Your pledge can be made in one donation of $1,000 or incremental amounts by check or through our secure website. To make other arrangements, please contact Kendall.